I'd love to hear this, I suspect its great, but probably won't because I don't own a turntable. 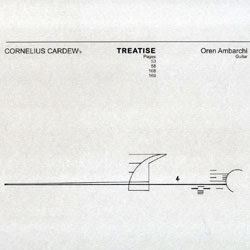 Just an observation, but when CDs are the most common and cheapest form of playback for most people out there, I wonder what Cardew would have made of his music being released in a format not easily accessible to all? Good question. Still, you, Mr. Pinnell, have no excuse. pretty sure the "most common and cheapest form of playback for most people out there" is illegal DLs, and I'm sure it'll be there soon enough if it isn't already, which Cardew probably would have been quite happy with. I haven't heard this yet, but I do have a copy and a turntable. Perhaps yes, there are more illegal downloads in the world these days than CDs, and I am sure Cardew would certainly have approved of them. This isn't a free download release though. Its a "limited edition" vinyl release. If I personally wanted to be sure of hearing the music as the musicians intended I would have to spend around £20 on the disc even if I had a turntable to play it on. I should add that I am only wondering about the release format in view of Cardew's thoughts on these issues, not my own. again, I'm pretty sure Cardew would vote for free DLs, legal or illegal, since there are major regions of the world essentially unable to buy CDs at almost any price. so, if this is a real concern for you, maybe that's what you should do with your release of Keith's Treatise as opposed to putting it out on CD, music and notes available for free DL. Yes maybe that's not a bad idea at all. Might run into problems with Peters Edition, who can be pretty fierce with copyright infringements.